Our survey is about which hand left-handers use for various activities, how left-handedness runs in families and how left-handers are affected by their hand preference. Thank you very much to all of you who completed the survey and we have now analysed the results so far, which make some interesting reading. These links take you to the sections of our results analysis below or you can just scroll down the page to see it all. How does left-handedness run in families? 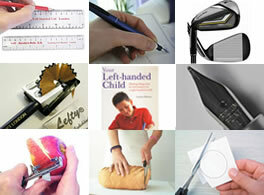 Which hand do left-handers use for various activities? What are the effects of being left-handed? How does being left-handed help or hinder? 39% of our survey respondents were male and 61% female. It is generally thought that there are slightly more male left-handers than female so does this just reflect the fact that males are less likely to fill in surveys? We asked about the handedness of family members to see whether being left-handed runs in families. No-one has yet discovered a gene that causes handedness but anecdotal evidence indicates that it does run in families. The results below show the percentage of left-handers for each family member, based only on the surveys completed by left-handers as “you” and ignoring all blank boxes. For example, 14% of left-handers had a left-handed mother but only 5% had a left-handed grandmother on their mother’s side (grandmother2). Left-handedness seems to reduce with additional children, both with the person’s own brothers and sisters and their own children. Could it be that the more children you have, the less left-handed they become? We asked which hand people used for the following tasks and the results below show the percentage who used the left. There is a very low percentage of people who eat left-handed with knife and fork (i.e. with the knife in their left hand and fork in the right). We don’t find this surprising as it is consistent to always feed yourself with your dominant hand – 95% of left-handers use a spoon on its own in their left hand and 74% also use a fork in their left hand. We think there has been some historic mistake here – using the fork in your left hand should be called “eating left-handed” and it is the right-handers who have got it all wrong and change their feeding hand depending on whether they are using a spoon or a fork. We asked about what effect being left-handed had on our respondents’ lives and this is what they told us. Some research has shown that left-handers are more intelligent and we certainly seem to think so ourselves, with 58% of left-handers considering themselves more intelligent than average! Having 85% considering themselves more awkward or clumsy than average was a surprise – we thought that it was right-handers who thought that about us. However, it does show the extent to which living in a right-handed world has a negative effect on us. I think that I problem solve in my own kind of way – often people don’t understand my thinking as it appears non logical – but to me it seems considered.. OK its a right handed world but I LIKE BEING DIFFERENT. Hinders when I’m sitting next to a righty when eating. If being left handed is what makes me so creative then that is a particular help. I think through growing up using right handed things you get used to it. When using right handed scissors it leaves me with sore thumb and fingers sometime resulting in blisters. I believe that all left-handers see and experience the world from a slightly altered perspective than a right-hander and this I take to be an advantage. Believe being left-handed enables you to see the world in a different way to right handers for some reason. Seem to be less conformist and able to see things from a different perspective. Amazed growing up – things that may have seemed so obvious to me – while rest of family (with exception of other left-handed members – father & brother) – could not see them at all. Makes one feel bit of an outsider with friends (majority right-handed). Found it difficult – growing up – to find people to relate to on same level / similar wavelengths. For my work I am able to visualise pipe layouts underground which helps me solve problems. We hope you have found the results interesting and amusing – at least we all know there are millions of other left-handers out there facing the same challenges and getting the same benefits. 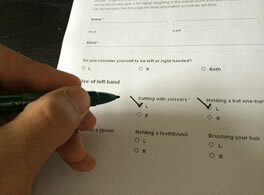 We will be following up the survey with a series of in-depth reports on particular aspects of being left-handed and we will publish these on the Anything Left-Handed website at as well as sending them to all registered Left-Handers Club members. I am a PhD social psychologist very interested in left handers. Would you kindly let me know how you selected your respondents? I have three left-handers (that I know of) in my family. I know how to design and collect data/information and have many publications. I have a theory on left handers that you have not mentioned. Please give me more info on how you selected your respondents, i.e. those whom you questioned, and what percent answered. Did more men than women get approached and or answered? Thanks.